Florida Governor Replaces Broward Sheriff, Citing 'Incompetence' "Sheriff [Scott] Israel has repeatedly failed and has demonstrated a pattern of poor leadership," Gov. Ron DeSantis announced. Former Coral Springs Police Sgt. Gregory Tony will replace Israel. Broward Sheriff Scott Israel refused to resign for nearly a year but on Friday, he was suspended and replaced by former Coral Springs Police Department Lt. Gregory Tony. "He failed to protect Floridians and visitors during the tragic Fort Lauderdale International Airport shooting in 2017. He failed in his duties to keep our families and children safe during the devastating shooting at Marjory Stoneman Douglas High School on Feb.14, 2018. These incidents demonstrate Sheriff Israel's repeated incompetence and neglect of duty," DeSantis continued. 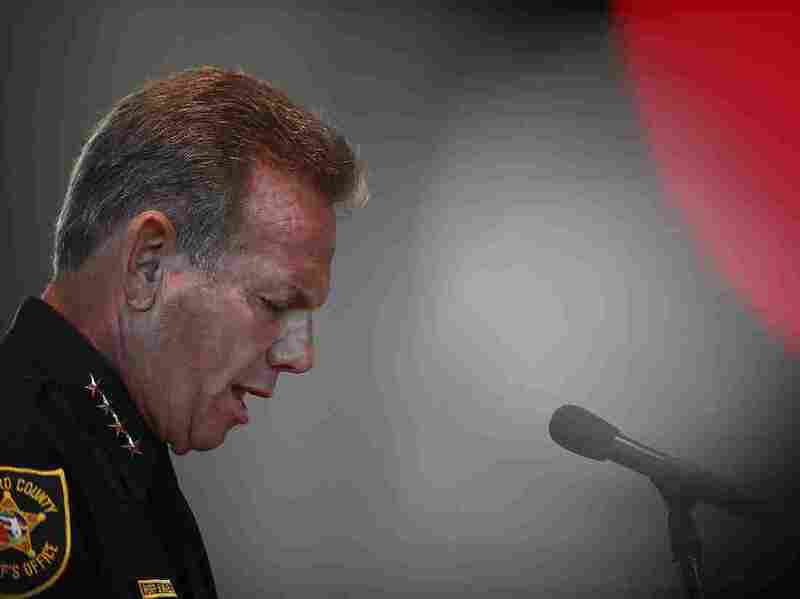 "For these reasons, I am suspending Sheriff Israel from office effective immediately," he wrote. In a separate statement introducing Tony, DeSantis added, "The people of Broward County deserve accountable, competent leaders who can safeguard our communities." "It is my intention to embark on this enormous task to restore the confidence of families and residents of Broward County toward the Broward [Sheriff's] Office, which also requires that I fix the problems that exist," Tony said in the statement. Israel plans to contest the suspension, according to the Associated Press. The Florida Senate would make the final decision. "There was no wrongdoing on my part. I served the county honorably," Israel said Friday. Israel was reelected in 2016 and would have remained in the position through 2020. "[Tony] left the Coral Springs Police Department after 12 years in 2016. Tony now has his own company, Blue Spears Solution, which specializes in active-shooter training and provides threat assessments on schools and other businesses." Israel has been the target of public outrage for his department's handling of the Valentine's Day shooting last year in which 17 students and teachers were killed by a former student. Israel's removal from the helm of the agency has been expected since the new governor was sworn in. While campaigning, DeSantis said he would have dismissed Israel for his role in the deadly shooting. Earlier this month, a state-appointed public safety commission investigating the high school massacre and law enforcement's response, issued a scathing report that was critical of Israel and the department. Among several damning conclusions, the report found that the deputy assigned to the school – Scot Peterson – "failed to act consistent with his training and fled to a position of personal safety" during the shooting. Additionally, several more Broward deputies responding in the incident were slow to enter the building where students and teachers were being shot. Israel was singled out for a poorly timed change in policy allowing sheriffs to choose whether or not to enter a building where there an active shooter, where previously they were trained to enter. According to the panel, that created confusion and led to inaction by eight deputies responding to the high school shooter. The commission also accused some sheriff's deputies who responded to the campus of providing testimony that contradicted evidence captured on surveillance footage on the day of the shooting. The report claimed Broward sheriffs as well as the FBI neglected to follow up on tips regarding the shooter and the danger he posed to students and faculty months before the attack. But Israel has consistently defended his deputies and his own role in the tragic events, resisting repeated calls for his resignation. In a letter to then-Gov. Rick Scott dated Feb. 24, 2018, he explained that Coral Springs Police Department officers were the first to enter the school because that department had "received he initial 911 call, and were dispatched to the scene knowing it was an active shooter incident, before the call was ever transferred to Regional Communication for dispatch for BSO." Israel also launched investigations into Peterson's actions on the day of the shooting and allegations that other deputies failed to confront the shooter. "I've given amazing leadership to this agency," Israel said on CNN, weeks after the shooting. "You don't measure a person's leadership by a deputy not going in to a ...," he added, trailing off. The following month, the Broward Sheriff's Office Deputies Association took a largely symbolic vote of no confidence against Israel, leading union President Jeff Bell to subsequently ask Gov. Scott to remove or suspend the sheriff. "He fails to listen to the people," Bell said of Israel, according to CNN. "He fails to listen to the membership and he wants to blame everybody else for his problems."